Self-titled “Informationista” Elaine Alligood, MLS, has survived—and thrived—through her fair share of industry changes as a clinical librarian. Often playing an influential role, Elaine’s experience ranges from witnessing the birth of MEDLINE while working at the NLM in 1971 through now assisting clinicians in finding the best (read: not Googled!) evidence-based research to help treat some of the most well-deserving patients—U.S. Veterans. Working for the VA since 1995 has had its share of challenges, but 2015 was a particularly volatile year. An internal investigation in 2014 identified dozens of veteran deaths as a result of long waiting periods to receive medical attention. And although the VA Boston Healthcare System enjoys below-average patient wait times, 2015 funding from the VA’s central office was re-directed to hire more than 3,000 health care professionals. While this shift in budget was understandable, it forced not only the VA Boston library but the entire virtual VA New England Knowledge Library Service to be even more meticulous when choosing content and proving value of both eContent and staff services. Read how Elaine has managed to stay positive and continue to embrace technology during a time of budget cuts and research demands through our informal Q&A below. How does working at the VA differ from other medical libraries? There’s a commitment amongst my VA colleagues to a higher mission, serving our Veterans. While we’re the only VA Network to have consolidated librarians and libraries into a New England wide eContent Library, we share, counsel, and support each other whenever asked. The VA is an enormous health care system, largest one in the United States. It’s a bureaucracy on steroids and quite daunting at times—we’ve learned to cope with it, as frustrating as it is. Our users, clinicians and researchers, often involve us in their research process—it’s very exciting and intellectually challenging. What residual effect has the budget reallocation had on you and the VA Boston library in general? It’s hit us very hard this year. FY16 budgets are just a bit lower, forcing us to choose costly content very carefully. Recently we calculated our ROI for eContent and staff services using the National Library of Medicine’s calculators. We calculated a 683.32% ROI metric! Not too shabby! It’s going to come in handy as we lobby for additional resources. I have to admit, some days we feel like Rodney Dangerfield—always justifying our existence by our results—but they’re such great outcomes it’s a pleasure to justify them. Budget cuts are unfortunately not limited to the VA library. How are you dealing with the loss of content? What we can’t provide in the moment, or must obtain, we try to be as creative as possible. Sometimes it pays off, and sometimes we can offer clinicians an alternate route to what they want. We’re not above screaming and yelling – metaphorically – to make the data case for obtaining a database or a needed product users require. It’s a challenge, for sure! During your career, how have your users’ needs changed? In many ways now we focus on users’ info tech skills, using handhelds, learning how to search for evidence, how to create an evidence-based search strategy, develop their synonyms/concepts, etc., choose databases, manage citations, use ENDNote, and way more. I teach the nurse residents how to do evidence-based nursing practice research—it’s great fun to see how they evolve into critically thinking about how best to improve their practice—based on research evidence. In our experience, usage is the key factor in retaining subscriptions. Is that your primary concern when deciding which titles to keep? Yes, it’s all about the usage. We librarians work really hard to get the word out about all our eContent. Promotion is crucial to building closer relationships with our users and champions. It develops stronger relationships, a greater understanding of their needs and support when they want additional resources we hadn’t planned on. Opportunities to collaborate or develop projects with clinicians often emerge in the process of discussions about the collection, new journals, or new databases. You worked for Elsevier from 1984 through 1990; how has this experience helped your career? It was an exciting time as information technologies were evolving into the CD-ROM arena – seems humorous now – but it was just so cutting edge then! As the EMBASE manager for North America I was quite close to EMBASE users and private tape customers. I did loads of training and conference presentations, as well as tape sales across the US and Canada at hospitals, medical schools, and pharmaceutical companies. I made it my business to know what my customers needed/wanted. The experience gave me a very keen awareness of what we call User Experience today, but in those days it was all about the Training Materials—the “How do I” search to get the best results. Today, I focus on the WIIFM (What’s In It For Me) with our users. What do users need to access and search the Knowledge Library’s content from outside or inside the firewall? We try to meet with folks one-on-one in order empower the users who didn’t go to medical school with a laptop. If that means a little techno-hand holding, we do it. Our goal is their success. Informationista is a great self-title. Where did the idea come from? It’s the addition of an A to Informationist, a new title first identified in an editorial in Archives of Internal Medicine describing the new notion of embedding librarians on clinical and research teams. I simply accessorized Informationist with an extra A. In my mind it was a combo of fashionista and Sandinista – as in the revolutionary aspect of throwing off the Hush Puppies, the bun, and the shushing finger stereotype of librarians. There is a fantastic line in your email signature: America May Run on Dunkin’ BUT Health Care Runs on Information. How do you stay up-to-date on what’s happening in information services? I’m a Starbucks fan, myself. . . but that tag line just came to me one day while I was nattering on to a clinician making the case for what I could do for him. . . when it just rolled off my tongue. I don’t tell clinicians how to practice their specialities—but I can tell them how best to follow the literature, research, etc . . . yet so often they want to believe they know better than I how to keep up, or how to find an answer via Google! Staying up to date is my big challenge. I try to monitor, social media, Twitter, etc. along with email lists, and scan the headlines, as do my colleagues who then re-tweet things. We all do it—sort of enables us to passively monitor the hot clinical and research news and pass it along. I don’t want to inundate my users, so I try to be judicious in selecting what to send. Anything else you’ve learned from this experience that you’d like to share? I so love what I’m doing, and I love the continuing development of new knowledge delivery technologies . . . as big a pain as they are sometimes. . .they are valuable tools for delivering clinical knowledge at the speed of a Tweet, so to speak. I see how they’ve changed the landscape of clinical medicine and research and of course publishing. My advice is to embrace them and bend them to our needs, use them to re-invigorate what we do. As an undergraduate and Washington DC native, Elaine snagged a summer job at the National Library of Medicine in the Lister Hill Center and was present at the birth of MEDLINE in 1971. After earning her art history degree she succumbed to the call of medical librarianship and headed to Library School at the University of Maryland. While in school she worked at the National Cancer Institute. She joined the Welch Library at Johns Hopkins, as a reference librarian, and after continued on to the University of Virginia Health Sciences Library. 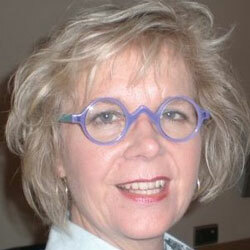 In 1984 she moved to New York City as Elsevier Science Publisher’s Manager for North American EMBASE operations. She moved to Boston to work for The Countway Library at Harvard Medical School. Giving in to the call of the emerging field of technology assessment, Elaine moved around the corner from Countway to the VA Health Services Research & Development group’s Technology Assessment Program-VATAP. For 16 years she was involved in all VATAP projects as an informationist and knowledge manager. In 2011, as a member of a VA task force to re-design and consolidate the New England VA libraries, she played a key role in developing the consolidation of VA New England’s libraries into a virtual 24/7 knowledge library. Active professionally, Elaine is the past President of the Massachusetts Health Science Libraries Network. In the recent past, she presented at the HTAi conferences in Krakow, Rome, and Barcelona.